Trump Is Using American Foreign Policy As His Stress BallThe president’s Syria tweets confirm that he has no coherent goals for foreign policy beyond his own instant gratification. Trump Questioned Why CIA Avoided Killing Terrorist’s Family: ReportPerhaps “you have to take out their families” was more than chilling campaign rhetoric. Tillerson’s Firing Brings America Closer to War With North KoreaThe secretary’s departure suggests Trump will kill the Iran deal in May – and sabotage the prospects of diplomacy with North Korea in the process. The White House Just Sent an Ominous Signal About Its Plans For North KoreaVictor Cha was about to become ambassador to South Korea — until he criticized Trump’s plan for a preemptive strike on Pyongyang. Graham: 70 Percent Chance of War With North Korea If It Tests More NukesThe hawkish South Carolinian is credibly terrifying in describing Trump’s intentions if North Korea keeps being North Korea. 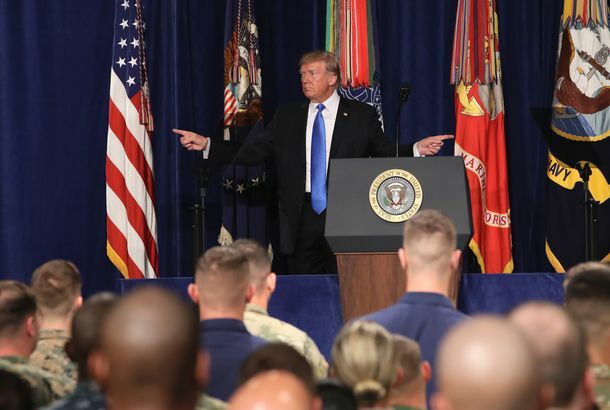 Trump’s Bold New Afghanistan Strategy: Neither Bold, Nor New, Nor a StrategyTo the extent that it’s bold, it’s dangerous; to the extent it’s new, it’s vague; to the extent that it’s a strategy, it’s Obama’s. U.S. Shoots Down Syrian Warplane for First TimeSunday saw some unprecedented escalations in Syria’s long conflict, including a cross-border Iranian ballistic missile strike on ISIS. PissPigGrandad Is No MoreBrace Belden, back from Syria and readjusting to life in the Bay Area, has a new Twitter handle. Top ISIS Leader in Afghanistan Killed in RaidAbdul Hasib died in an April 27 raid, along with dozens of ISIS fighters, in eastern Afghanistan. He had led the terror group for less than a year. Report: White House Mulls Sending Thousands of U.S. Ground Troops Into SyriaH. R. McMaster is reportedly pressing his colleagues to consider sending up to 50,000 ground troops to fight ISIS. 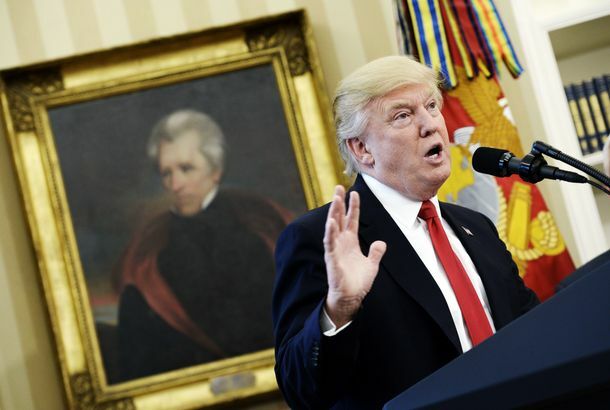 Trump’s Jacksonian Attack on SyriaLike Andrew Jackson, Trump believes in speedy, incredibly violent force, taken without consultation with Congress, to deter evildoers such as Assad. 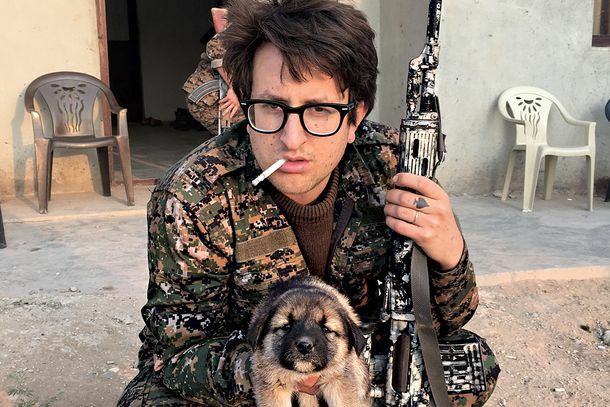 PissPigGranddad, the Punk-Rock Florist Who Fought ISIS in Syria, Is Coming HomeBrace Belden became a radical icon when he went to take up arms against terrorists, build a socialist utopia, and tweet jokes about the revolution. There Were Two Major Victories Against ISIS in Iraq and SyriaIraqi forces retake most of Mosul airport, while Turkish-backed Syrian rebels expel the extremist group from al-Bab. The Mattis-Bannon Race for Secret President May Be Most Important of Our LivesBannon says a war with China is inevitable. Mattis is telling our allies that we don’t need to take “military steps” against Beijing or Tehran. The Little Girl Who Tweeted From Syria Opens Up About Night Her House Was BombedBana Alabed sat down with the BBC for a new interview. The Little Girl Who Tweeted From War-torn Aleppo Has Been RescuedBana Alabed tweeted about living in Aleppo during airstrikes. This Little Girl Is Tweeting About Her Heartbreaking Life in War-torn SyriaBala Alabed, 7, lives in Aleppo and is sharing her daily struggles there. The Great Human vs. Animal War Has Begun in NYCThey’re not taking “hoot” (owl for “no”) as an answer. American Deserter: Why AWOL U.S. Soldiers Are Most at Risk in CanadaIt used to be the safest place for a war deserter to go. Now it’s just about the worst destination. Media Organizations Gather Troops and Prepare to Go to War in 2016There are hundreds of people already covering every moment of the 2016 presidential election. Rand Paul Wants to Formally Declare War on ISISSuch a thing hasn’t happened since 1942. U.S. Ground Troops Have Landed in Iraq to Plan Yazidi RescueThe religious minority is still trapped there by ISIS militants. Bowe Bergdahl’s Ayn Rand-ian JournalThe returned Taliban prisoner sent his notebook to a friend before leaving his post in Afghanistan. Long Island’s 92-Year-Old Movie Bootlegger Is Untouchable Because he’s basically a saint. Americans Apologize for Burning Korans in AfghanistanProtesters were not pleased in the slightest.